We visited the legendary BB King’s club when we were in Memphis in March. The lights to the club lit up in neon that beckoned anyone with a hankering to hear the blues, us included. We ate dinner then found a perch in a window seat, the four of us, my husband, and sister in law Debbie and brother in law Craig. We sat, sipped and listened to band after band until late in the evening soaking up music and enjoying one another’s company and although he was not there, the aura of B.B. King himself. With his passing on May 14, 2015, Beale Street will be forever changed. King was 89 years old and passed away in Las Vegas. 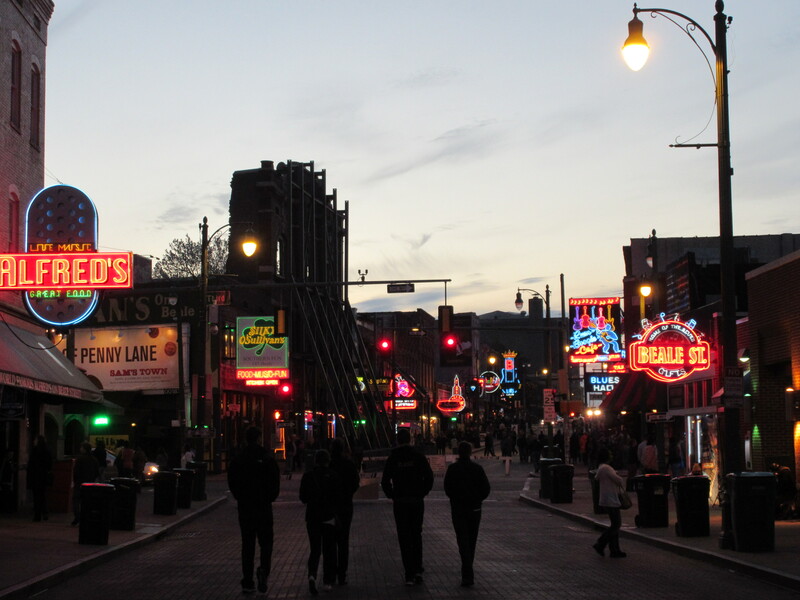 The essence of Beale Street, although in my eyes founded by W.C. Handy. has King’s lingering, towering presence and makes me ask just who he was. My interest goes a bit deeper when I learned that King like me suffered from diabetes. Both his mother and sister succumbed to the disease. He lived a long life though and leaves a huge family behind through two wives he sired 15 children and the post I read claimed 50 grandchildren. King played an amazing 342 times and only four months ago cancelled his 2014 tour after becoming ill.
Born in 1925 Riley B. King was the son of sharecroppers on a farm outside of Indianola, Mississippi. Like many before him his first exposure to music was gospel through his mother and grandmother. At church he learned to sing in the church choir and was exposed to the Blues from his great Aunt. Finding he could make money singing, he arrived in Memphis in 1946 and stayed with his cousin singer Bukka White. A radio slot earned him a gig landing that eventually pulled in a regular job on the radio station WDIA. On the radio King took on the persona of “Beale Street Blues Boy” that eventually got shortened to the name we all know him by today, BB King. He made his first recording in 1949 and his success was on the rise. Log onto http://www.biography.com/news/bb-king-dead-obit for more details about King’s life. This space is too limited to do him justice. The flicker of the neon will not be the same on my next visit to Memphis. As I sit in my kitchen making a Mexican dinner to celebrate my recent trip to Puerto Vallarta we are dining with the same couple Debbie and Craig that we traveled to Memphis with. Tonite it will be important to raise a glass to remember Memphis and the legacy of the “Ambassador of the Blues”. Remembering BB King on a May summers eve in central Illinois.